You’ve heard of beatboxing right? You take a microphone, some attitude and make like loose change in the tumble dryer. Well what if you threw in your harmonica? The answer is you’d be harpboxing. Here’s our main man Yuri Lane taking harpboxing to the people of Chicago. Tack så mycket Filip. Thanks very much Filip. Now be honest, how many times have you lost your ferret and wondered what to do? Loads of times right? Well the solution is simple. Play a harmonica. Too bad this doesn’t work with TV remotes and car keys! 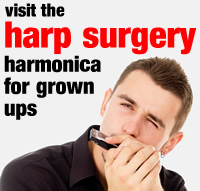 Welcome back to our crazy harmonicas series. This clip comes from the film Pigskin Parade made in 1936, which featured a young harmonica specialist called Robert McClung. Robert lived from 1920-1945. Not much information about Robert is available; we suspect more will be found, now that his crazy harmonica playing has been rediscovered. Regular visitors to the Toot Suite will know we feature all kinds of unique and whacky harmonicas. Here’s our friend Dave ‘MadCat’ Ruth demonstrating some of the crazy things he can do. We reckon this is the whackiest harmonica in the world. Enjoy!